As a Licensed Dealer and Bonded RV Broker and Dealer we can provide you with the best experience to sell or buy an RV. 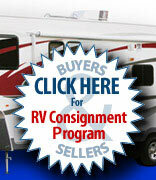 If you are looking for an RV to buy, or if you wish to sell your RV, look no farther. We have a limited number of RV's in our gated lot and many more available to show or sell. We only sell units that we would feel comfortable sharing with our family members. We provide a complete line of service which includes selling, PDI, financing, extended warranties, and storage for your unit. Our friendly, experienced associates have enjoyed the RV life style. They will be happy to answer your questions and assist you in finding the unit that will help you get on the road and discover all of the beauties of the USA. We have traveled to 45 of the states. Stop in and see our map and help us get you on the road to RVing. The memories you create will be unforgettable! but reaches throughout the USA to show and sell RVs. CUSTOMERS FROM 5165 CITIES AND 95 COUNTRIES HAVE VISITED OUR WEB SITE!